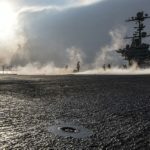 The Nimitz-class aircraft carrier USS Harry S. Truman (CVN 75) conducts operations on a regularly scheduled deployment. Truman is currently deployed as part of an ongoing rotation of U.S. forces supporting maritime security operations in international water around the globe. A Day in the Life. VFA-25 Fist of the Fleet.